Today is International Vulture Awareness day! Zoos, conservation organizations and other groups around the world are celebrating vultures this weekend. Vultures serve a very important role in the world's ecosystem. By removing dead animal remains these scavenging birds clean up the environment and help prevent diseases from spreading. Unfortunately, most of the 23 vulture species that can be found around the world are endangered. Threats include habitat loss, changes in livestock management, persecution, and hunting. Show your support for these amazing creatures by attending one of this weekend's many Vulture Day events around the world and support a vulture conservation organization in your area. Check the official IVAD website for a list of all participating organizations. Go out and celebrate vultures today! ... or print our vulture coloring pages and stay home for some cute vulture coloring fun. We're celebrating Vulture Week because this Saturday, September 5th, marks International Vulture Awareness Day (IVAD). This commemorative day has been celebrated since at least 2009 and aims to highlight the importance of vultures and vulture conservation through education. 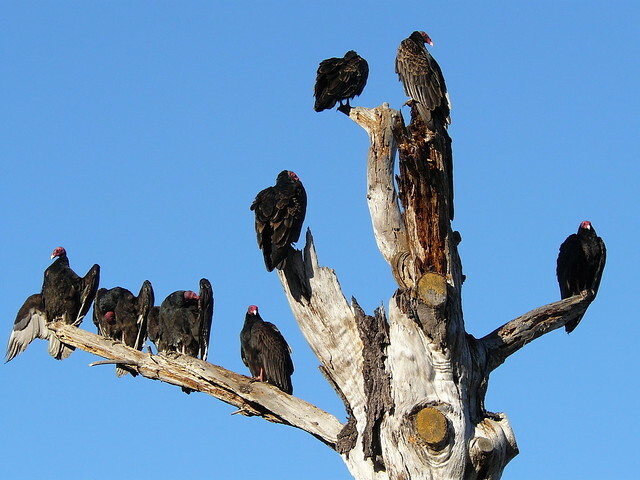 In today's post we're sharing some keywords that pertain to vultures. This vulture glossary also includes definitions that apply to other bird families, but are important topics to understand when learning about vultures. If you're going to be talking about vultures, you are inevitably going to be talking about carrion, because that is what most vultures eat. Carrion is the decaying flesh of a dead animal. Other scavengers that consume carrion besides vultures include eagles, opossums, coyotes, and some beetles. Vultures in the New World (the Americas) are not closely related to Old World (Europe, Asia, and Africa) vultures. Since many vultures of both types have similar features like bald heads and scavenger behavior, how can it be that they are not closely related? The answer is convergent evolution. Broadly, this refers to organisms evolving similar traits while lacking a common ancestor. Birds, flying insects, and bats are not related, but they have all evolved the capacity to fly. Similarly, vultures in both the Old and New Worlds have evolved special traits to help them specialize in feeding on carrion. With few exceptions, no matter their location, vultures fill a similar niche in the ecosystem. The crop is an expandable part of the digestive tract of birds and some other animals. The muscular pouch, close to the throat, is used to store food before digestion. The full crop of the Lappet-faced Vulture can hold up to 3.3 lb of meat! Vultures are known to gorge themselves at feeding sites. They will eat until their crop is completely full, and then sit full, digesting their food. It is thought that vultures sometimes gorge themselves to the point of being unable to fly. A group of vultures in flight together, particulary soaring on thermals, is known as a kettle. Kettle may describe other birds flying in this way, including mixed flocks which may or may not have vultures. Preening is the act of cleaning or grooming. Birds, including vultures, preen themselves to keep their feathers in top shape. Allopreening refers to social grooming between multiple individuals, often performed to strengthen social bonds. Black Vultures are known to take part in allopreening at roosting and feeding sites. Often allopreening concentrates on the head area, a spot that a bird cannot easily reach with its own beak. Vultures have extremely corrosive stomach acid, which helps them to safely digest dead animals that may be infected with diseases and toxins. The stomach acid protects the birds from contracting and spreading disease. Gut bacteria in vultures helps them to withstand several kinds of toxins that may be found in decaying flesh. Taxonomy is a scientific system for naming and organizing living things which share certain characteristcs. The taxonomy of vultures can be confusing. New World and Old World vultures aren't closely related, despite their physical and behavioral similarities. Some scientists think that New World vultures are closely related to storks. With new advances in the study of DNA, sometimes single species are split into distinct species. The Long-billed Vulture was split into two distinct species: the Slender-billed Vulture and the Indian Vulture. The Yellow-headed Vulture was split into two species in the 1960s: the Lesser and Greater. The big day is almost here! Tomorrow our Vulture Week will conclude on International Vulture Awareness Day! Celebrate Vultures at a Vulture Day Event! The Mountsberg Raptor Centre in Campbellville, Ontario will celebrate the day with special programs. The event will feature two resident Turkey Vultures named Casey and Buzz. Visitors may also find some Birdorable-related vulture fun and free activities during the Centre's event! The Cheyenne Mountain Zoo in Colorado will celebrate IVAD with plenty of special events, including vulture feedings, a giant game of vulture-themed Jenga, vulture sock puppets, and much more! The Friends of Blouberg Nature Reserve group in South Africa will have vulture lectures, a vulture-themed treasure hunt, and vulture breeding colony viewing. The Avifauna Bird Park in the Netherlands will celebrate IVAD on both Saturday the 5th and Sunday the 6th. Watch vulture feedings and see a special bird show. There will also be activites for kids. Lehigh Valley Zoo in Pennsylvania will honor vultures with events on IVAD, including vulture programs, keeper talks, and a resident Black Vulture. The Edinburgh Zoo in the United Kingdom will celebrate IVAD with special vulture talks, a flight show featuring Turkey Vultures, and storytelling sessions. The Birmingham Zoo in Alabama invites guests to celebrate International Vulture Awareness Day with them. Learn learn about vulture conservation and how important these birds are to our ecosystem. Events for the day include a scavenger hunt and special Keeper Chats. The Raptors in Canada will celebrate IVAD on Saturday and Sunday. They will have flying demonstrations with vultures and specially themed vulture talks. Fundraising at the event will raise moneyfor the Peregrine Fund and a local rescue organization. The AGFC Delta Rivers Nature Center in Arkansas will have a special vulture presentation, which will include a flying demonstration with their resident Black Vulture. The Cascades Raptor Center in Oregon invites visitors to meet their resident Turkey Vultures on International Vulture Awareness Day. They will also have special activities for guests related to vultures. These are just a few of the organizations that invite the public to visit and celebrate vultures. Find a complete list of participating groups here. Because the information here may be updated infrequently, be sure to contact any organzation prior to your visit to verify event timing and activities. Join us all week long as we highlight the world's vulture species leading up to International Vulture Awareness Day on Saturday! Vulture week rolls on with some cool vulture facts. These extreme facts show how diverse this amazing family of birds can be. Among New World vultures, the Andean Condor and California Condor can both reach up to 48 inches in length, and weigh 26 pounds or more. In the Old World, the Cinereous Vulture reaches up to 47 inches in length. Female Cinereous Vultures may weigh up to 31 pounds! In the Old World, the Palm-nut Vulture has this record. They only grow to be about 24 inches long and weigh just around 3.5 pounds. The Lesser Yellow-headed Vulture is the smallest in the New World, reaching between 22 and 24 inches in length. The longest lived Eurasian Griffon reached over 41 years of age in captivity. A captive-raised Lammergeier lived to be over 45 years old. The Andean Condor is believed to be capable of living 50 years or more in the wild. A captive Andean Condor that lived at a zoo in Connecticut lived 79 years! The longevity record for a wild Turkey Vulture is over 17 years, while a wild Black Vulture reached over 25 years of age. The Turkey Vulture is the most abundant species of vulture in the world, with a population that probably numbers into the millions of individuals. Many vulture species in Africa and on the Indian subcontinent are in peril. The population decline of the White-rumped Vulture is an unfortunate example of this. In the mid 1980s, the White-rumped Vulture was considered to be the most abundant large bird of prey in the world. Since that time, the species has declined rapidly, losing up to 99.9% of its total population in just 20 years. Most vulture species are sedentary, year-round residents throughout their range. In the New World, the Turkey Vulture is the only vulture spcies that has regular seasonal migration. Birds that breed in southern Canada probably travel at least 1,000 miles to reach their wintering grounds to the south, traveling around 100 miles per day of migration. In the Old World, Egyptian Vultures may travel up to 5,500 miles when they migrate from their breeding grounds to their wintering grounds at the southern end of the Sahara Desert. Relatives of vultures have existed for millions of years. Early ancestors of Old World vultures, in the now extinct Diatropornis family, existed in the Eocene epoch about 56 to 38 million years ago. The Rueppell's Vulture of Africa is thought to be the world's highest flying bird. It has been recorded flying at an altitude of 11,300 meters or 37,000 feet above sea level! Can't get enough of these amazing and important birds? Be sure to check out our great collection of cute and original vulture apparel and gifts. We're excited to offer several new apparel styles via our partner Zazzle. A new line of women's tank tops, more choices for babies and toddlers, and two all-over print styles are all brand new in our shop. Showing off these new styles are a couple of new designs unveiled for Vulture Week. New World Vultures (more styles coming soon!) features the seven species of vulture native to the Americas. These birds are scavengers who play an important role in keeping our environment clean. The birds here include the Critically Endangered California Condor and the widespread Turkey Vulture.Â New World Vultures is shown above on a Women's Bella Flowy Muscle Tank Top and below on a Baby Fine Jersey T-Shirt. Old World Vultures features the faces of all of the Old World vultures in colorful dots arranged in rows. Unfortunately many of these species face population threats. The vultures shown in the design include the unusual Palm-nut Vulture and the pretty white Egyptian Vulture. Old World Vultures is shown above on a Men's Adidas ClimaLite T-Shirt and below on a new All-Over Print T-Shirt. Today we'd like to share four brand new vulture-themed coloring pages with you! All of our coloring pages are free to download and are perfect for nature centers, zoos, and other environmental education locations and events surrounding International Vulture Awareness Day. Color our North American vultures in flight. The Turkey Vulture and Black Vulture are featured on the IVAD Coloring Page. This commemorative desgin can also be purchased on t-shirts and novelty items in our shop: International Vulture Awareness Day gifts. Our cute cartoon Andean Condor is featured along with big and bold letters, all ready to color on our Condor Coloring Page. This cute and colorful condor design is also availalbe for purchase on t-shirts and other gift items. Nature's Clean Up Crew was a new design in our shop for IVAD last year; this year it's featured as a coloring page too! Nature's Clean Up Crew Coloring Page. Brand new for this year is our New World Vultures Coloring Page. The seven New World vulture species are standing together in this new design which will be available on t-shirts and gifts later this Vulture Week. Remember that we have all of the world's vultures on their own coloring pages, which you can find on our special Birdorable Vultures Page. In addition to all of the coloring pages, you can find vulture-themed activity pages for free downloading as well, including connect-the-dots images, a vulture maze to solve, a fun vulture memory game, and more. And finally, don't forget about our popular Vultures of the World map. You can download the image or purchase the map on posters, t-shirts, and other items.